1. If you knew your best friend's spouse was cheating on her or him, would you tell her (him)? Never been in this situation, never want to be. Since my best friend is my hubby...if he is caught cheating I would tell him a few choice things, including where he will be sleeping next! I think I would question a good friend to see if they realize the damage they are doing to their life and their family's life. Hopefully they will wake up and fix the situation to the best it can be mended. 2. Soda in a can or a bottle? I like can...and yes we recycle. But I love Pepsi in a can. 3. What do you wash first, hair or body? Wash my hair and face first. 4. What advice would you give to any new mama? Sleep when you can and take whatever help is offered. It's so hard to accept help and allow someone to wash your dishes or laundry. But trust me, you will have many more loads to come. If someone is willing to help out in those areas, let them. Rest as much as you can so you can give that new little one your all. 5. What is your best hangover remedy? 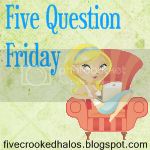 Head over to Five Crooked Halos to link up to these questions. customers for their survival, without customers a small business would cease to exist. otherwise remained closed to you.